Page Updated:- Tuesday, 09 April, 2019. 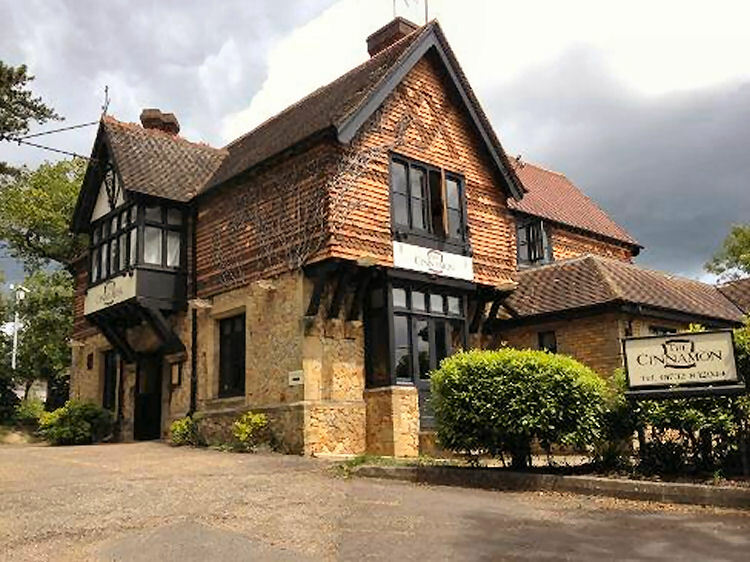 Above photo showing the former "Gate Inn" now operating as the "Cinnamon Square Indian Restaurant." Above sign left, November 1986, sign right, date unknown. The pub was opened in 1868, alterations to the building were made in 1936 and it finally closed for business in 2011 when it became an Indian Restaurant called the "Cinnamon Square." From the Kent and Sussex Courier, Friday 23 January 1874. Tonbridge Petty sessions. Tuesday, January 23rd. The Bench granted temporary authority to J. M. Quested (transferred from Charles Jenkins), to sell at the "Gate Inn," Hildenborough. 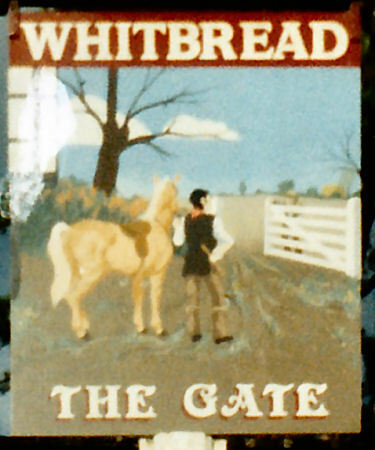 The licence of the "Gate Inn," Hildenborough, from William Jenkins to Matthew Quested. From the Kent and Sussex Courier, 22 May 1874. Caroline Barber, 36, charwoman, was charged with stealing, between the 1st of March and 30th April, 7 dessert spoons, a coat, a pillowcase, 5 towels, two saucers, a sheet, a basin, 8 spoons, a gold scarf pin, 2 table spoons, a dozen knives and forks, 7 plated forks, and other articles to the value of £3, the property of Matthew Quested, of the "Gate Inn," Hildenborough. Prosecutor said the prisoner had been employed at his house as charwoman. About a month ago he missed the coach produced, which had been dyed a darker colour. He could swear it was his coat, but he could not say why. He could not say to within a year how long he had it, but he knew he missed it a month ago. The prisoner was then in his service. Mr. Philip James Woolley, dyer, Tonbridge, said that on or about 19th April the prisoner brought the coat produced to him to be dyed black. It was a sort of mingled brown colour, very greasy, and in a very bad state. The prisoner promised to call for it on the following Saturday, but she did not come, and he handed the coat to the police. The prisoner, who was accompanied by another woman, gave the name of Mark Carnell, of Paddock Wood. In answer to the prisoner, he said he was positive that she gave the name of Mark Carnell. P.C. Irwin said he received information of a coat being lost, and on the 13th inst. he went to the prisoners house at Hildenborough. She was then the worst for drink, and he only asked her if she had any towels, which he denied. Afterwards she called at his house and asked him how he came to accuse her of stealing things. He told her that a coat had also been lost at the "Gate Inn." She then said she knew nothing about a coat. She had seen one hanging up in the knife house, but she did not take it. On the 16th he and Mrs. Quested called upon her. She told him he could search the house and he did so. He found the two china saucers produced, a dog collar with "Hewitt" upon it (Mrs. Quested's maiden name), a woollen scarf, two spoons, a basin, a pair of scissors, a towel, and a handkerchief. On the following evening, by direction of Superintendent Dance, he again searched the house, and on the bed he found a sheet and a pillow-case. 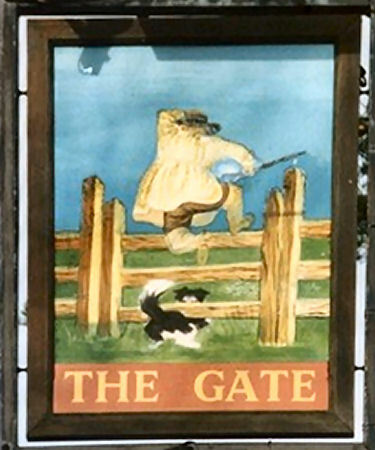 On the pillow-case was the name of "Page," the former landlord of the "Gate Inn." On Monday afternoon he received two spoons and a fork from a woman named Bowrah, of Hildenborough, who said she brought them of the prisoner. The prisoner said she found the dog collar on the road, and to Mrs. Quested she said she took the things intending to take them back, and she had sent the coats at the dyer at Tonbridge. Mrs. Eliza Quested said she identified all the articles as her property. Could not say that the prisoner had been in Mr. Quested's bedroom. Superintendent Dance said as there was other property not yet recovered, he wished for a remand. The Bench remanded the prisoner for a week. Kent & Sussex Courier, Friday 14 September 1877. Applications for extension of time. At the Tunbridge Petty sessions, on Tuesday, Mr. Chainey, the landlord of the "Gate House," Hildenborough, applied for an extra hour on the occasion of a supper at his house to tradesman's servants and others. He stated that he could not have the supper until 8:30 o'clock, and he closed at 10 o'clock. Those present would consist chiefly of coachman, who will be coming, several of them at least, from a distance, and could not leave their work and get to the house before 8 o'clock. He produced letters from Mr. Kemp and Mr. Greenfell, asking the Bench to grant him an extra hour. David Coventry, of the "Crown Inn," Cowden, applied for leave to keep his house open until 3 o'clock on the occasion of a ball at Mr. Derbyshire's. He wished the extra time for accommodation of the servants. The chairman thought the house might be kept open for the shelter of the servants without there being supplied with beer. Mr. Hankey thought that so long as the house was opened they were bound to supply. The Bench adjourned to consider both applications, and on their return the Chairman said: The Bench have carefully considered these matters, and they have determined having regard to their rule already announced to refuse both these applications. It is, however, open to the applicants to consider that after the usual hours of closing they can keep their houses open for the purpose of shelter, and the sale of other than intoxicated liquors. Mr. Hankey:- Do you understand what the feeling of the Bench is? Mr. Coventry:- That we are not to keep open for the sale of liquors after 10 o'clock. Mr. Homersham Cox:- You may sell tea and coffee. The Chairman:- We don't say you can. Mr. Harrison Cox:- We don't say you cannot sell tea and coffee, but we have no power to say you can. From the Sevenoaks Chronicle and Kentish Advertiser, Friday 24 October, 1919. Open and Closed Cars for hire. Phone 255 Tonbridge. Sevenoaks Chronicle and Kentish Advertiser, Friday 04 January 1924. 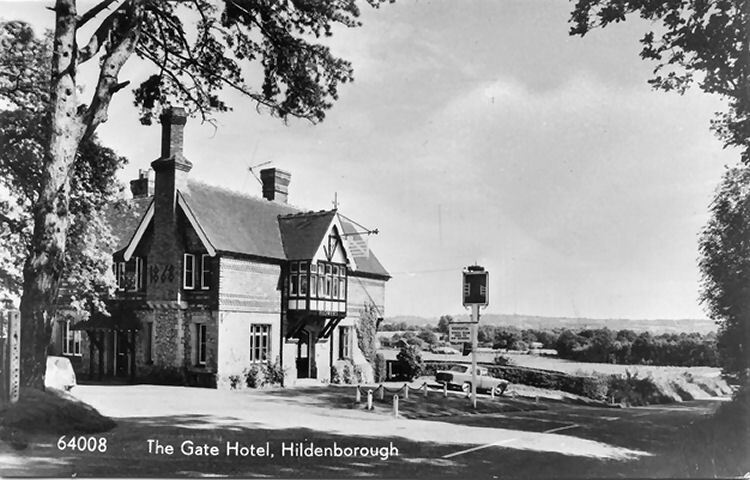 Mr. E Elvey Robb, of London, applied for the transfer of the license of the "Gate Hotel," Hildenborough, from William Ernest Blaber to Ernest Rowley. He told the Bench that applicant's wife was until a few days ago was the licensee of the "Shakespeare Hotel," Sittingbourne, and early in December she suffered a conviction before the Sittingbourne Bench for having permitted the selling of beer, whisky and wine during prohibited hours, on November 15th. Mr. Rowley was not directly responsible as he was not the license holder, but Mr. Bobb said he would be wanting in frankness if he did not tell the Bench that he was assisting his wife in the management of the house, and no doubt he had a measure of re responsibility. Mrs. Rowley was fined £10 and costs. Previously he and his wife were interested in two licensed houses. In 1919 jointly they took the "George Hotel. Robertsbridge" and his conduct there was satisfactory, but after a time applicant had to relinquish the license, which was transferred to his wife, owing to his bankruptcy. He conducted a business as an export merchant in Indian goods, but owing to the slump in the Indian exchange he filed his petition, but had since been granted a discharge. Superintendent Ford said he was instructed to oppose the application. 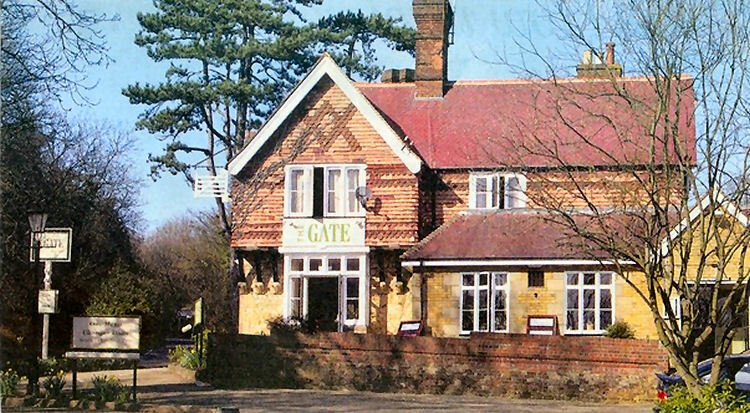 A report from the East Sussex Police stated that the conduct of the "George Hotel," Robertsbridge, was indifferent, and one of the references was genuine, but the person was not one in whom the police could place reliance, as the person had been summoned to appear at Hurst Green for consuming liquor during prohibited hours. The Chairman said that in spite of Mr. Robb’s advocacy, the Bench were unanimously of opinion that the application ought to be refused.